I have had the desire to shape and expand myself and the world around me since I was a child; always searching; continuously creating. From building with legos, to forming bands in high school, to founding new businesses in my adult years, my path has always included the pursuit of passion and experiential growth. Arriving in the art business roughly 12 years ago, I have pursued being a professional artist with abandon, studying with fellow artists and constantly exhibiting my work. With over 100 solo, joint and group exhibits under my belt and over 500 local and national collectors, my sights are set on evolving my career on a national and international basis. The eclectic variety in my numerous styles is the product of allowing mistakes to be a part of the art making process. I embrace the dichotomy of vision versus freedom; control versus chaos. In the spirit of freedom and chaos, I employ a plethora of textures, colors and mediums while trying not to limit myself to any single style or form. My artwork is simply an extension of my life and personality. My paintings represent whatever it is I am feeling at the time. One layer at a time, I allow each painting to simply “become”. Through a combination of variety, depth and the pursuit of experiential growth, each piece of art becomes unique in technique, style and emotion. Franz Kline, Gerhard Richter, Jackson Pollock and David Adickes have been my main artistic influences. My styles encompass abstract, folk and impressionism. My mediums include acrylics, epoxy resin, latex and watercolor. I have published one book of my artwork, titled “Double Entendre”. I am close to completing and publishing my second book, titled “Pursue Your Passion”. I teach annual workshops on “the business of art” to help emerging artists find footing in the art biz. Experiencing life at it’s fullest is also my passion. I have traveled to Paris, London, Barcelona, South Africa, Amsterdam, Honduras, Cabo, Bahamas, Mexico and Copenhagen. I have gone skydiving (twice! ), run with the Bulls in Pamplona, Spain and I am learning how to surf in the Pacific Ocean. My wife of 29 years, Dana, is my soul mate and best friend. She also manages the logistics of our business. We live in Venice, CA, near our three sons (ages 28, 25 and 22). With strong roots in Houston, Texas, we find ourselves traveling across the country on a monthly basis. We LOVE what we do and it shows through the artwork, the philanthropy and the “art family” that we have created over the last decade. We invite you to join us on our journey! Taft and Dana have a heart for “paying it forward”. Their mission is to use their talents to help serve their community. 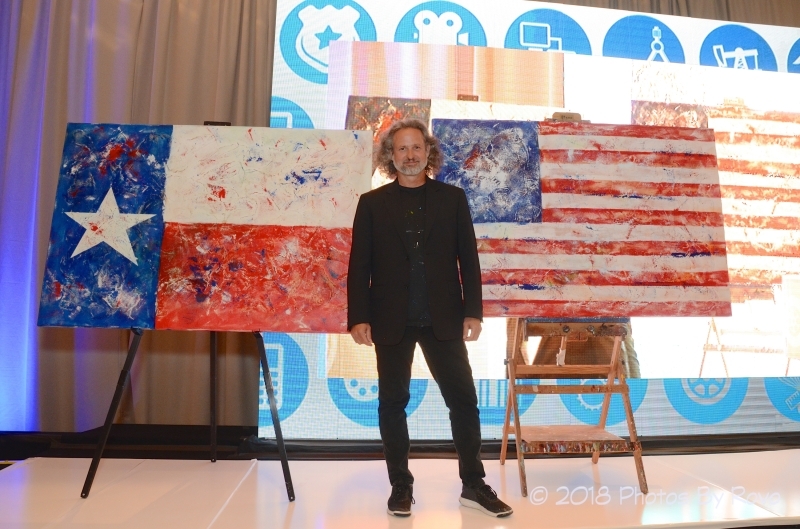 By painting “live” at fund raising events, Taft and Dana are able to raise over $100,000 annually for local charities. By acquiring an original piece of Taft McWhorter Art, you will be joining an “art family” of over 500 collectors. We host monthly exhibits and events that are “By Invitation Only”. If you are interested in becoming a collector, click below! Join the TMA "Art Family"